Suction grab bars offer a drill free solution to installing shower grab bars. Since they are portable and easily removed, you can bring them along when you travel. No more damaging walls. A suction grab bar or a vacuum grab bar is a device used mainly in the bathroom but can be an asset for the elderly or handicapped in other rooms of the house as well. Suction grab bars are a portable handle that serves as a solution to problems with stability during standing, sitting, or situating between the two. The handle of the suction grab bar rests between two suction cups that are controlled by individual vacuum levers. Here is a short list of suction grab bars reviews of popular and highly recommended suction bars from users like yourself. Shower Suction Grab Bar 11.5 Inches – This suction grab bar can be used on any flat shower non porous surface. It measures 11.5 inches. Simple to use. Sturdy Single Grip Portable Grab Bar – Good for heavy duty use and is portable. This suction bar provides a very sturdy grip with almost a diameter of 5 inches on the rubber pads. 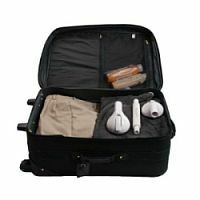 Packs easily in standard luggage bags. Affordable Suction Grab Bar – Affordable and has large suction pads. Has a color indicator that tells you if the suction is secured or if you need to re-affix the suction. Cheapest grab bar that meets your needs. Telescoping Suction Portable Grab Bar – Has textured plastic on the bar to provide for a non-slippery grabbing surface. Can be expanded from 19 to 24 inches for an extra long bar. This suction grab bar can be broken down into three pieces to fit any travel bag. Which is the best suction bar for your needs? That all depends on the location and the amount of weight strength you require. Bigger suction bars require a flat surface that must be larger than your standard tile sizes. Remember the suction must fit inside the shower tiles and not pass the edges, grout lines, borders or sides. This will reduce the grip strength and be potentially dangerous for the user. If you are a traveler, then perhaps something small that fits in your luggage will be best for your portable needs. 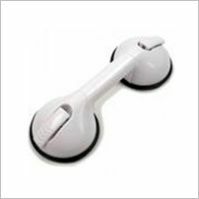 If you need the suction grab bar to be diagonally placed, then a telescoping suction bar would work best, helping to extend the range for your needs. So first figure out where you want to put the suction bar and then the rest will fall into place. Portable suction grab bars are most frequently used in the shower to help a person get in or out and also to help keep them balanced should they decide to remain standing while washing. Another common use is for sitting down on and getting up from the toilet. The safety and support offered by a suction grab bar is unmatched and the best part is that it travels with you. Shower suction grab bars can provide over 100lbs of suction power with heavy duty grab bars providing over 300lbs of pulling force. One thing to note is a suction grab bar may, over time, lose its vacuum seal especially with cheaper brands. This is dangerous especially when you rely on the strength of the bar when entering and exiting a shower. Make sure to check the grip on the suction grab bar and re-apply for a firmer and tighter hold. Be sure to purchase quality products that can stand behind their handicap shower grab bars. Do suction cup grab bars work in most bathroom and shower environments? They absolutely do! as long as you follow the proper installation. Apply the suction grab bar to a dry, smooth, clean and flat surface. Press the suction rubber up against the wall so all the air is squeezed out, and then use the lever to lock on the surface. If you are installing it on shower tiles or on handicap shower tubs, make sure the tiles are larger than the suction portion of the grab bar. On smaller tiles, the grout lines allow air to enter and this weakens the grip. The shower suction grab bars work as long as it creates a vacuum seal between the rubber and flat surface. If you have small tiles, find a way to remove the small tiles and replace with larger tiles that can fit the whole suction. Drilling into the wall is your other option. Dense and smooth surfaces work the best for suctioning while dry wall and painted walls are not suitable for these products. One reason why people choose suction grab bars is to prevent drilling holes in their expensive tile walls. Wall suction grab bars do not leave any permanent damage to their surroundings. For many renters not allowed to drill or modify shower walls, a removal suction grab bar solves that problem. A suction grab bar is also great for someone who requires different positioning in the placement. They can be mounted in any direction, vertically, horizontally or diagonally. Of course, when travelling, it can be very useful because fixed handles will not always be available. Portable grab bars are convenient for those constantly on the move but require the amenities of their handicap accessible homes. They are also easy to pack into any luggage. The larger the handle size, the more expensive the suction grab bar. Prices range from $60 to $130 for typical models. Larger model sizes can go up to 29 inches in length. Suction grab bars can also be purchased in smaller sizes like 13 inches. Although there are ADA guidelines for grab bars in the bathroom setting, when used in a personal and private setting, the placement should be set to meet your own demands.